Is this where you can cut the most the quickest? The post a couple of weeks ago about the whole income inequality thing brought out some good insights and raised several new questions. That echoes one of the comments to the aforementioned post. Regardless of which side of the inequality divide you're on, we're all making about 3.5 times what our grandparents made back in 1913. Which raises the question: Where is that extra 2.5 times going? As I researched statistics and other studies on the issue, I discovered they either focused on percentage of income or on absolute dollars. The first type ignores real increases in income while the second ignores proportion of income. So, in order to get an idea of where the “raise” went, I cobbled together two household budgets, one in 1913 and the other 100 years later (both in 2012 dollars). Neither can be totally accurate, nor will they align with your exact budget, but they do provide a “broad strokes” idea of how our spending has changed. In order to scale the numbers properly, we'll say Mr. Average earned $1,000 a month in 1913 and $3,500 a month in 2012 (both are surprisingly close to the real numbers). Then we'll ask the question: What did he do with his raise? 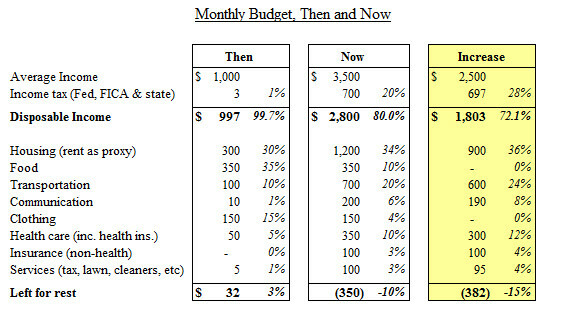 You can see spending patterns changed over time. Food and clothing, as a percentage of our spending, dropped dramatically, while other spending categories took up the slack (and more). Wouldn't it be great if Mr. Average would have been able to put the raise of $2,500 toward his savings and retirement? Or at least the $1,800 left over after the increased taxes, over which he doesn't have control? The two glaring increases are housing and transportation. The automobile added some other costs too, like parking expenses for commuting, and licensing (essentially a property tax on vehicular assets). Cars also increased the cost of housing because now you house not only your family, but your car too. In 1913, Mr. Average had no need for a garage, let alone two. Nowadays, the rent difference between an apartment with no parking amenities and an enclosed double garage is probably $150 to $200 a month. Speaking of housing, this expense took the largest bite out of Mr. Average's raise. Even cursory research shows that the average size house didn't change much between 1900 and 1960 — about 1,000 square feet, no garage, one bathroom and two or three bedrooms. This is a layout that served a prosperous nation well for more than a century. Back in 1913, only 45 percent owned their homes. Buying a new home then took a lot of saving, because you pretty much had to buy it for cash. Cash buying limited what people could afford, and that in turn caused people to make do with what had become the standard: a home with less than 1,000 square feet. The early '50s saw the introduction of a new concept when the first tract homes were built in Levittown, New York. Because of mass production techniques, bang for the buck hit a new high, and they couldn't keep up with demand. It was such a phenomenon that Mr. Levitt made the front cover of “Time” magazine. A Levittown house was the thing to have for young and growing families of the baby boom. In 950 square feet, it boasted two bedrooms, one bathroom, no basement and no garage. And people loved it so much they lined up around the block to get one. Good luck trying to sell a Levittown house today, when the median new home is over 2,000 square feet. This is not the high end, mind you, just the middle of the market. What caused the average home size to double in 50 years, after not changing dramatically for hundreds of years? In reality, it was debt. Consumer credit, mainly in the form of home mortgages, took off in the late 1960s. Thanks to mortgage debt, home ownership rocketed from 45 percent to around 65 percent today. But it's no coincidence that home sizes also took off with the widespread availability of mortgage credit. Mr. Average's income rose 250 percent, or 80 percent after increased taxes. You'd think that would be enough to save more and still enjoy an increased standard of living. Why isn't it, then? Mr. Average took half of his after-tax increase and spent it on a bigger house with an attached garage, and spent almost as much on his cars, cell, cable, and Internet. Therefore, the first place for anyone struggling to make ends meet, or to save for their future, to look is the square footage they occupy. If you're going to save on your expenses, you start with the biggest one, which is usually housing. Saving 10 percent on your housing can equate to saving 25 to 30 percent on your food. A thousand square feet was adequate housing for more than a hundred years. For most of the world, that might even be high end. Shouldn't it be sufficient for today, especially with smaller families? My wife and I live in a 1,500 square foot home, modest by the standard of most. It has some serious design flaws, but it's still way more than we can get by with if we had to cut. Downsizing living accommodations is not the cure for all financial ills, let's be clear about that. And it is not without controversy. But it is the place where Mr. Average has spent most of his raise. And, if he can't make ends meet, that has to be the first place to consider for cuts. What do you think about living in 1,000 square feet? There are 94 reader responses to "Is this where you can cut the most the quickest?". When we bought our home 16 years ago, it was 1200 square feet. We could have gotten a much larger mortgage, but my husband didn’t want to be stretched too thin. We’ve refinanced twice to lower the rate and cash out for an addition. The original split-level with 2 baths and 3bedrooms would have been fine with 1 kid, but the extra room helped when we adopted our daughter. No car has sat in the garage since we moved here. (Too full of Stuff.) basically, the falling interest rates on our mortgage paid for the addition over time. We have 2 kids, and 3 bedrooms is plenty! It’s nice not having a guest room because all our family can afford to stay in a hotel, so they do, and we get a little more privacy. The biggest benefit we have seen is our utility bills. We live in Tennessee and in the summer our electric bill never went about $80. With so little house to cool, the AC is running as hard! I live in New York City so 1,000 square feet is palatial to me. It is not uncommon for a 1,000 square foot apartment to sell for hundreds of thousands of dollars, over a million in some neighborhoods. Our house is 1200 square feet and we could sell it for $1.1M today. We love it, the house was built in 1926 so tons of character, wood mouldings, original wood floors, etc. And we have a yard twice the size of the house and are able to live outside most of the year as well. But…that means when something new comes in the house, something must go out. I hate clutter and a small house requires vigilance to keep it clean and organized because you use every room every day. Unfortunately in 1990 I was 12 years old so home buying wasn’t an option. :) I scoff at how the cost of living in the Bay Area drove me out of my hometown. A 1925 house sounds absolutely lovely! Well, for perspective, when I bought my almost 70 year old house in 1990 my mother thought I had lost my mind! She also grew up in the Bay Area and purchased a home in Los Altos for $25,000 so it’s the same story, different era. I used an inheritance for a down payment. With a family of 5, a 1,000 square foot home would be tough. It depends I guess on where you live and what outside activities you can do. For a lot of modern families they spend a lot of the time inside (computers, game consoles, etc. ), in which case they need a lot of indoor room. It used to be (and still is for us) to go outside to play, ponder, relax, work, catch up with the neighbors, etc. We used to live in a 1000sf house just outside of DC. When it was just the two of us, it was fine. Even when we brought our twins home, it was fine. Once they became mobile, the limits of that space became clear. We spent as much time outside as we could, but when it’s 100+ degrees for 90 days in a row, there’s only so much of that you can take. We moved to a 2500sf house in the Midwest. It’s bigger than we need, honestly, but it cost less than half what we sold our previous house for, and we were glad to have the extra room this past winter, when Hoth-like cold kept us inside for months on end. Now it’s warmer, and we are outside all the time, enjoying our gorgeous yard, the enormous park across the street, and our pedestrian-friendly neighborhood. We live in 1100 square feet with two active boys and two cats. The great things are, my kids are always supervised, if it gets too quiet, there are only a few places I need to look to get them out of trouble quickly. I will say the winter started to stretch thin with a 3.5 year old and almost one year old when we couldn’t go outside. I am a stay at home parent, so we are never home! We go to the Y where I work part time a few hours a week, we go to the library, he attends preschool, we go outside in nice weather and to indoor play places in poor weather. Lately my husband has been feeling like our house might be too small in the future, because we are considering having one more child or possibly being foster parents, but truthfully we don’t “need” more space. We could probably use more storage if we have another child, but my older son keeps asking to share his room, we just have to wait until the transition happens for our little one to a “big” bed. We’ve been looking at bigger houses that we could afford in the same school district, and honestly we would be trading down in quality (of neighborhood and house) or spending 2.5 times what we are currently spending. I grew up in a 1,000 s.f. house. My sister and I shared a bedroom, my grandmother had the third bedroom. My parent’s master had a 1/2 bath, which was rather a luxury in the late 1950s. We had a living room and a “family room,” where the kitchen and dining table were. We also had a utility room. No garage–just a carport. The closets were small, which wasn’t an issue because people just didn’t have all the clothing they do now. The bathroom only had one sink. My husband and I live in a 920 s.f. apartment, which is pretty adequate. Our retirement house, currently a rental in another state, is going to feel huge at 1362 s.f. We live in a 2br 1 ba 930 sq. ft. home with our dog. The only times I really wish we had more room are when we have people stay over and managing the bathroom rotation becomes a science. Otherwise, we have everything we need and no extra rooms to clean! I have friends with 2 and 3 kids in the same model house and they manage. Living in a smaller house saves money for other things. It takes planning and intention, but you can certainly live with 4 or 5 people in 1000 sq. ft.
First, what do the %s refer to? I can’t quite tell. Second, the transportation spending is very interesting. How did people get around without a car in 1913? I suspect that they didn’t need to – there were fewer people in big cities and perhaps they just walked to their local jobs. Things have changed in 100 years. It is not realistic for everyone to be able to walk to work – or even use public transportation, which we now have. I do that because I live in the heart of an urban center. But I also pay a premium for my housing to live there. I think its a bit misleading to say that Americans shelled out for new shiny cars just because they could. Housing is a bit different – yes, we have simply upgraded. I just stayed at my partner’s mom’s home. It’s tiny – they had one bathroom for 5 people and didn’t think anything of it. We do have higher expectations today and we are willing to pay for it. In 1913, suburbs didn’t exist. Those came with the automobile. Trains, trams and walking were pretty much it, which dictated shorter commuting distances and more compact cities. Even 60 years ago, public transit was a lot more available than it was in the 1980s. Public transit still doesn’t cover the number and hours that it did in 1950, though it’s slowly becoming more available, especially evenings and weekends. We’ve also seen the return of human-powered transport (i.e. bicycles) to some extent. Are you kidding? The USA had great public transportation in the first half of the 20th century. Passenger trains, Interurbans, trollies, and horse-drawn busses in the cities. Do some research on the internet about how the U.S. sold its soul to the car in the 1950’s and you will be amazed at what we gave up. The math in the charts are wrong because you are not counting housing. In the Now column, take home pay is $2,800. Expenses total $3,150, leaving a monthly deficit of $350, not a surplus of $850. The change doesn’t affect the comparison or the main question. The numbers on the pie chart change a little bit, but the proportions remain the same. We lived in a 2 bed/1bath with 3 kids and one on the way and we were very comfortable, but it required creativity. The last little one is a terrible sleeper and a loud “cry-er” so I am very grateful that we are in a larger home now with more sleeping arrangements. I also really like having a guest bedroom. HOWEVER, I wish I didn’t live in such a big home (go figure) as it is more expensive to heat/cool, takes forever to clean, keeps us more separate during the day and costs more. 1000 square feet would feel like a squeeze, but you’re right – it was done for 100 years and is big for most of the world, so I am positive it can be done! Very interesting to think about! We recently moved back to the Omaha, NE area. We own a large house, but have been renting it out for a couple years. Our tenants have a lease until Sept, so we are renting an apartment. Our family of three (plus a dog and two cats) are currently living in 982 sq ft. There are two bedrooms and 1.5 baths. It seems crowded, but that is mostly because of our enormous bedroom furniture (purchased for our house) and all our stuff, half of which is in storage. When we move back into our house, it will seem cavernous at about 3100 sq ft, including finished basement. As I said earlier, it has seemed a bit crowded, but we have managed. It would be easier if it wasn’t a basement apartment with tiny windows, but we’ll survive until Sept. It would also be more comfortable if we didn’t have so much stuff. BTW, I just looked up the house I grew up in and it is 988 sq ft, 3 BR, 1 BA. My parents had the house built in 1957, when they had four children. I was born in 1965, and my younger sister in 1966. My oldest brother started college shortly after my younger sister was born. By the time I started school, my next eldest sister was a senior in high school. I only remember having to deal with two adults and two children most of the time growing up, and it wasn’t too bad. 1000 square feet in a house is doable– if there are unfinished dry storage spaces, and if you have the right balance of genders and pairing in the residents*. But your analysis appears to assume that Mr. Average has increased the size of his living space and can save by decreasing. However, the cost for the same space has also increased drastically. The Two Income Trap by Elizabeth Warren and her daughter explain some of these differences. It’s good reading. We live in a 3 bed, 1 bath 980 sq ft home, with my husband, our daughter, and me. For now it works. we are also planning on having another child soon, who will occupy the 3rd bedroom. we have a nice .5 acre lot, so there is a lot of extra room outside (which kind of makes up for the smaller home). However, the only thing we can’t get past is that our home was built on a slab, meaning no basement. We have a 1 car garage and an attic, but the no basement thing kills us. when baby number 2 comes, we have no idea where we’ll put our computer/paperwork and extra toys, as our daughter’s spillover toys are currently occupying half of the 3rd bedroom. (Maybe a good opportunity to have a yard sale!) that being said, i love our small home and we’ll make it work either way (maybe add on eventually?) Oh – and as far as utilities, YES it is much cheaper to heat/cool! It’s pretty amazing to think about how our standards have changed over time. When we bought our first (and current) home five years ago, we knew is was more square footage than we needed, but we didn’t really appreciate just how this would impact our bottom line. Heating/cooling larger homes gets very expensive, even when you stick to reasonable temps (68 in winter daytime, 60 winter nights, 75 in summer). More rooms means more lights, more cleaning, more furnishings, and more insurance and property tax dollars. And while this hasn’t really been the case for us, there’s also the notion that we expand (buy more) the amount of stuff we have as our space increases. Myself, my boyfriend, and our large dog live in a 2 br, 1 bath home, with 725 feet to work with. Both bedroom closets are the size of a doorwall which can be a challenge. Thankfully, we do have a partially finished basement and a detached 2 car garage, otherwise storage would be a challenge. We plan on staying here at least until we start to expand our family, if not through to baby #2. No reason to move with such an affordable house in a thriving downtown area. Living in a small home means we have a tighter control on the amount of Stuff that comes into our home. This means we spend less money on things. If we can’t think of a place to put a new thing, then we can’t buy it. We also have lower utilities, etc., from our smaller home. The only downside to living in a small home is the condescending comments from others. People talk about my house like it’s a shack, and that they can’t understand why we would want to live in such a “tiny” (their words, not mine) home. I avoid talking to these people when possible. A coworker and I were talking about mortgages, at some point I said I appreciated our low mortgage The coworker who admittedly has a very nice house (which costs 3x as much as well) then replied “but you live in a cardboard box!” He was probably a bit kidding, or that’s how many middle class people see a well constructed 1400 sq ft bungalow? I feel ya. I had a spendy friend refer to my condo as “dark and creepy”. We’re not friends any more. My parents built their small, 950 sq ft 2 bedroom 1 bath cape (unfinished attic and basement) in the 1970s. One kid and two additions later it’s a 4 bedroom 2 bath monstrosity with a great room and a finished basement. It was great when I was growing up – we could host large family parties, sleepovers, bridal/baby showers no problem, but now that I’ve moved out I think they go upstairs maybe once a week. The heating bills this winter were ridiculous even with the thermostat locked at 55 degrees. I grew up in a 670 foot, two bedroom home. The one male child, out of three, had to take the made over double garage room. But we managed just fine. Just before moving into our retirement place we sold our four bedroom, two living area, two bath 1500 sq. foot home. Husband and I were alone in it and it was way too large for us. One realtor we interviewed called it a starter home. Since we were in our 50s and 60s we were majorly insulted and couldn’t get her out of the door fast enough. One other thing that has not been discussed is how clothing prices have dropped in the last half century. When I was growing up all clothes were made in America and it was a treat to get new things, they cost proportionately. I honestly can now buy clothes by the armful. With a coupon and a sale they are sometimes cheaper than they were in the 1950s. I think it depends on the size of your family and your lifestyle. 1,000 square feet would be a dream come true for our family of two. We live in a space about half that size and it is tight given that I work from home (and need my desk and ergonomic office space), have no storage, no outside living space (yard) and have hobbies that’s impossible to pursue in our space. There is no one size fit all when it comes to living space. Very interesting – I would have guessed transportation would be even higher. It really is funny that houses are 3x as big as back 100 years ago. We don’t really need all that extra space, but some folks feel like they have to have it. We’ve lived in a 760 sq ft, 4th floor walk-up that we moved out of when small children made the hike up challenging. We’ve lived in 1500 sq ft with 2 kids and it was great for 15 years. I admit we downsized to a larger house (2400) mostly because of the way it was built into the land (15 acres). It’s astounding. True, we don’t need the space with the kids grown and gone, but when they come home for the summer, I hope they enjoy the retreat as much as I do. We don’t spend much on furniture and goods, and propane heating is prompting us to put in a wood stove, but frankly I hope that we are healthy enough to live here for the next twenty years. It looks very modest (wood cabin) from the outside, but the sun comes in to every room (southern exposures to heat in the winter, trees block the heat in the summer). This is mostly to say, yes, sometimes a house can be what you saved for and something that gives great joy. Not instead of saving for retirement or paying for college, but a peaceful place. I work at home and enjoy my space. 1,000 square feet is huge, at least to me. Two of us, and our two cats, live in a 691 square foot condo. We have one bathroom, two regular sized closets, and one utility closet. No attic, garage, or extra storage space. How much space do you REALLY need with two people and two cats? Be honest with yourself. If you need a lot more space than that, you are doing a pretty poor job of managing your stuff. The trick is that is seems really big to us. It seems big to us because we moved here from New York City where apartments are tiny and expensive. Speaking of NYC…the best thing I ever did for my finances was to move from a $1,500 studio in Manhattan to a $750 two bedroom in Brooklyn (with roommate). It is true –sometimes moving is the smartest thing for your wallet. This is a great piece. I agree with the conclusion you made. As much as I would love to have a larger home, I do get that a larger home means larger expenses that aren’t fun to the think about. Have a nice cathedral ceiling, got to heat that space as an example. It is best to make what you have work and look great and cut the expenses of home ownership as much as possible. It is same idea that cutting back on lattes won’t make you rich, getting a good deal on a car, home, education or other major expenses and saving the savings will get you rich…slowly of course. Age of the home can make a big difference, too. My husband and I (no kids) moved from a 1200sf to 2300sf home and our utilities went way down. The smaller home was built in 1907 and was brick. If you don’t know, brick homes back then didn’t have insulation, just one layer of brick, space (air insulation) and another layer of brick skimmed with plaster. And then there were the windows – lovely, but not at all efficient. Our heating and cooling costs were cut in half on a house twice the size (built in 1990). That being said, my husband and I have since decided that our next and hopefully final home will be smaller for a number of reasons, many others have listed: more difficult to accumulate STUFF, less to clean and maintain, no wasted space. I think things went wrong when preceding generations were determined to provide their children a better life than they had,and they grossly mis-interpreted the word “better”. People are constantly being told that they “need” things, but really it’s just that the companies “need” to make a profit…no, they need to constantly GROW their profits in order to outservice their competitors. So houses get bigger even though there’s little added value, and are built cheaper for marketability. Food got cheaper, and it also got more processed(which contributed to the higher healthcare percentage). People need 2 and 3 car garages because their nice cars are too nice to keep outside. They are cars, that get driven outside…anyone else see the idiocy of this; I can maybe understand in areas where it snows in large quantities. Also we replace things before they need to be replaced. Cars and electronics are upgraded less than a year since the last version. We replace things that need to be replaced sooner than needed to in the past because they are of lesser quality (IKEA!). People do not DIY anymore and farm out basic repairs and services for high prices. I stick to my original belief that I do not believe middle-income Americans are underpaid. Not if you see what many spend their money on. There is no reason you cannot live comfortably on 45-50k per year in most of America. We need to be more respectful of our money, our work, and our time. We need to carefully evaluate what we need and what are just bells and whistles meant to extract our energy expended to earn the money. My house, built in 1964 is a one bedroom 856 sq ft concrete bungalow with a bonus room off the kitchen. The original owners raised their son and lived there for 40 years. They took good care of the home and the father had a good job but they just didn’t see the need to move. Don’t even get me started on bedroom sizes. I never understood why bedroom size mattered at all? Why??? Do people do acrobatics in their bedrooms? All you need is room for the bed, a closet, and a dresser. Why the need for empty, palatial space that serves no purpose? You go in, crawl into bed and fall asleep. You have a whole house, and all of the wonderful outdoors for your playground. Breakfast bars and fireplaces and home theater systems in a bedroom? I mean come on. To your ears maybe, but not to mine. I think Lmoot is awesome and I always look forward to her comments– even when I don’t agree with them, I know they come from a good place and that she practices what she preaches. Thanks El Nerdo! :) Only second to your awesomeness of course. @ Jane. I promise you I’m not. I’m actually quite an optimistic and bubbly person. I agree I tend to sound ranty when I type mainly because I’m a fast typist, yet short on time and that sense of urgency to get my thoughts out may make it seem that way because I don’t have time to edit the bite out. I will admit that mindless consumerism and the decline of quality (and consumer expectations of quality) in America are two of my biggest hot-button issues so I won’t deny there was some heat behind that last post. But if I must be angry, I much prefer to come off at least as “loveably cantankerous”. I’m so glad you chimed in on this one, ElNerdo. You and LMoot often write long, well-thought-out comments that add to the GRS experience. That you both care enough to take the time to share your experiences is obvious. Your comments, positive or negative, have helped many. Pejorative comments like the one above, not so much. P.S. WordPress just scolded me. It said I was posting comments too quickly and to slow down. WTF? This would never happen over at MMM! Although I actually agree with you on the necessity thinking towards these non-necessities – I have found that *for me* it makes no sense to be outraged over differences in values. Someone that desires status more than I do could be outraged or scoff that I’m choosing to work only 4 months this year and am leaving >$100k on the table by doing that. It’s a beemer! It’s a house! Why would any sane person do that?!?! The internet is a terrific place for outrage p0rn to proliferate. Some bloggers even have forums that mock other people’s spending choices… And some bloggers mock people who choose ER above over-consumption (compared to *their* needs or wants, not the ER-striver’s wants). I think it was Darwin’s Money who wrote a post slamming Dividend Mantra’s lifestyle choices a year or so ago. Sure gets lots of comments and people riled up though to think that way. There’s that Spanish proverb “‘Take what you want, says God, ‘and pay for it. '” Many of those people may have to work into their 60’s and 70’s. Or maybe not. Maybe they kick the can down the road and their kids pay for it. Maybe they live off of social security alone while you or I have savings. So what? Anyway, if I want my values to be honoured by people as right for *me*, then I have to value theirs. 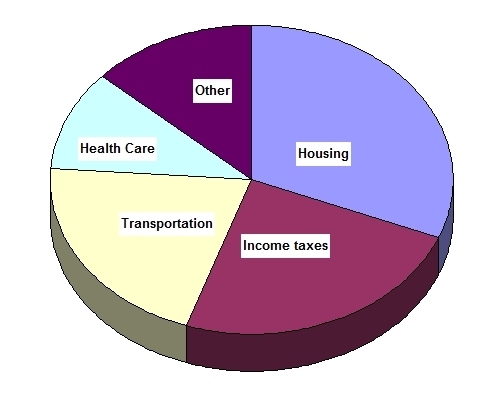 I’d be more concerned with taxes and healthcare than housing and transport. To the point that 1k sqft was good enough 100 years ago why isn’t it good enough today; caves were good enough 100k years ago why aren’t they good enough today? It’s a slippery slope with that logic. It was tough with the bathroom routine but we worked it out. I will watch “House Hunters” or similar type shows and listen to people whine about the home being too small because they want each child to have their own bedroom and bathroom…. really ? Fortunately those “reality TV” shows are fake. On House Hunters, the buyers must actually be in escrow on a house when the show is taped. The other two are red herrings. To keep the viewer guessing, they deliberately make negative comments about all three houses. Yes, they do sound over-privileged and whiny at times, but they are not actors and they actually do buy one of the houses. It’s quite like the old game show “What’s My Line?”. One real person, two impersonators. Staged? Yes. Fake? Not really. It’s fact-based entertainment. Not watching is always an option. They’re not professional actors, they do buy the homes but they do also read a script and are prepped on how to act. I don’t watch those shows so I’m not 100% clear about the scenario, but even with scripted dramas/comedies people are always living in huge places they couldn’t afford in real life. The goal of TV is to brainwash the populace into normalizing such aberrations. The consumer must always feel dissatisfied and want more, otherwise TV can’t sell ads. “Here’s a problem you didn’t know you had, and here’s what you need to buy to fix that problem!” Countrywide is on your side. Lather, rinse, repeat. I agree with the premise that a smaller house costs less to own & maintain. But I don’t know that it would be a quick cut since the housing market is still depressed. Not in Houston it’s not. The housing market is insanely hot right here at the moment. Nothing in my neighborhood stays on the market more than a week, and my assessment just went up 15%. I’ve thought about downsizing because our 3600 sqft house is ridiculously big. But our mortgage is not that big and we are still able to comfortably sock away money for retirement and kids’ college funds, and downsizing would probably cost somewhere around 25k in selling and moving fees. So we haven’t pulled the trigger on that yet and my philosophy is to USE the space for very large gatherings and housing out of town guests as much as possible while we’ve got it. 1000 sqft would be snug, but doable. I at least like having two baths. I think my next house will be closer to 2000 or 2500 which is a lot less than we have now but still plenty for two adults and three kids. I really really appreciate having a guest room since all of our family lives so far away. That is good news. Different parts of the country are experiencing different economies. House prices vary drastically also. So I guess all that needs to be taken into consideration if you are thinking about down sizing. I grew up with awesomely frugal parents in a 1300 sq ft house, a starter home that they ultimately stayed in for lots of excellent reasons. I never imagined that I could need more than that (except maybe a second bathroom because two grownups and two teenagers trying to get ready in the morning is a nightmare!). As an adult I now have a 1300 SQF home w/ a husband, two kids, two cats and two bathrooms (yay!). However, I work from home, hubby works from home part time and because we live in a different state than both of our families we have someone visiting at least every third week. I dream of a fourth bedroom/office. 1700-1800 sq ft seems like the perfect size to me. FWIW, we’ve also talked about building a “tiny house”/guest suite on our property and keeping our house as is. Well, I agree with some of this. I have lived in small-ish spaces most of my life. We are selling our 1500sf house and upsizing so that his mom and her friend Al Z. Heimer can live with us. We will have room for “them” and when necessary, a live-in helper. Yes, the bills are higher, but sometimes more space is a necessity. When we retire, and his mom is no longer with us, we will downsize. I’m writing because what matters is not how much square footage you have, but how you use it. No one is better than anyone else just because they live in less space. Some of the numbers in the article are so far off ($1000 a month average income in 1913? No, closer to one tenth of that…remember Henry Ford raising his workers’ pay to $5/hr?) and the comparisons then and now so unrealistic (health care, transportation, communications, for example) that it makes me question the author’s competence. But the conclusion — that housing is the biggest expense we have — seems close to the target. 1. A bigger house is kind of nice. We empty nesters have a 2900 sq ft house, far more than we’ll ever need. But it gives my wife peace of mind (“What if the children ever need a place to live in an emergency?”), and that’s priceless. Because the house is fairly new and energy efficient, our monthly utility bills range from about $75 in winter to about $200 in summer, ie, very affordable. Which leads me to point 2. 2. Where you live mostly determines what your housing costs are. We live in San Antonio. Mild climate, cheap housing. It feels good to not live in a 1700 sq ft house any more. All numbers are in 2012 dollars, so inflation is taken into account. The actual income in 1913 is not given, just the inflation-adjusted figure. We just had our 3rd kid and we live in less than 800 sq ft. It should work fine until the kids are older and become self-conscious about being different genders. Sometimes I wish we had just one more room… but mostly I wish we had less stuff! I have noticed that people always manage to fill up whatever space they have whether it is 1000 sq ft or 3000 sq ft. We have been working on it and are to the point where it would fit well with better organization. Much cheaper to buy shelving than to buy a bigger house. People hear how low our mortgage is and their jaw drops. If we get a bigger house it will be with cash or for the same monthly payment and we’ll only pay more in property taxes and utilities. Our < 1000 square foot home 3 bedrooms, 1.5 baths, was home to 7 – parents, 1 boy, 4 girls. My parents made it work. The guest bedroom was my brother's room, and he slept on the couch when we had someone stay over. I love watching HGTV, but there are times when the participants sound so totally over-entitled. And I love hearing how they "deserve" things. I think more people have been suckered into buying things they don't need because they "deserve" it, myself included. The first apartment my husband and I rented together was 250 square feet. That included the bathroom. While it was not sustainable long-term (all of excess stuff filled his mother’s excess storage, so it wasn’t perfectly ideal), ever since then we’ve made do with modest, one bedroom apartments and I wouldn’t do it any other way. The utilities are minimal, there’s less to clean, and we can only buy so much stuff. If we had kids we surely need more, but it’s definitely worked for us. We’re in a financially better place for it. Also, we don’t have any cars. We went from two cars to none — it’s been four years and we feel lucky that we can do without! When we are speaking of home sizes, are we considering the finished basements as square footage? That isnt a common way of expressing a house size where I’m from. So when I read that someone has say, 3600 sq ft, I’m imagining some huge mansion! We have a relatively large house for the general rare, and our main floor is almost 2000 sq ft. 1400 sq ft houses are very common here. But that 1400 is not including the basement. In Texas (and much of the south) we generally don’t have basements, so that’s total square footage. Housing is definitely a big place that people can save a ton of money if they’re open minded. However, I find an easier pill to swallow is transportation! You can still get around just fine in a $5,000 car vs a $30,000 car and you save a ton of money at the same time. I grew up in a family of 6 in a 1000 s.f. 3 bedroom, 1.5 bath (the .5 bath had a toilet and sink but no bathing facilities). No ideal but was the 1960s and not unusual. If we had less stuff we would need less space. Kind of a chicken and egg thing – hard to tell which came first. On the transportation side I saw a 1940s-50s vintage advertisement for a Whizzer (motorized bicycle) at a automotive museum. It said that the average man had a 6 mile commute – perfect for the Whizzer. Imagine how much less you would spend on transportation if you only had a 6 mile commute. The long commutes people do always amazes me. Just a gentle criticism–if you are properly insured (home, vehicle, extra umbrella coverage), then $100 / month is impossible in most of the country, even with a small house and a nondescript car. Actually, our home/car insurance add up to just about $100/mo. Our home is not that modest, and we have an earthquake rider. But we do have only one car, an old one with no comprehensive or collision coverage. We live in Oregon, which is cheap by California/NY standards but not compared with a lot of the Midwest. Not for everyone maybe, but definitely not impossible. I live in the urban south,not NY or CA. I live in a 2 bedroom, 1 bath 850 sq foot house built in 1925, which for me is just perfect. When I add other people to the equation, it becomes a bit of a problem if they 1)use the bathroom a lot (princess vs. tomboy), 2)need a lot of closet space for clothing and things 3)like to hang out in their bedrooms (mine are 10×10 – not ideal for a roommate situation). The kitchen is not much of an issue because it’s actually quite large in comparison to most modern kitchens. It’s hard for me to imagine that at least two generations of family grew up in that house – two adults with two children – so I guess I can’t complain! I know that one way I’ve alleviated the issue is by having vanities in the bedrooms (for primping), and other than that only using the bedrooms for sleeping. I also try to utilize the large attic I have for storage. We live in a 1955 brick home, a touch over 1,000 square feet. Two adults, two kids, two dogs. It’s tight. We pay slightly more to live in a walkable area with good schools, so it’s a compromise. For the same amount we could afford a larger home in an outer suburb. November through February I often regret this choice, but the good weather the rest of the year almost helps. If I did it over again I’d buy larger. American house sizes are mad. I think some British house sizes are mad at the other extreme (small) but seriously, I am looking at buying a 1,000 sqft 3bed 1bath house and there is currently a family of 5 living there no problems. Seems a pretty common size (most places we looked at were 800-1000 sqft) and set up here with no complaints. Thanks for this post. Quite thought-provoking! My wife & I have lived in Europe for the past 20+ years and the culture in respect to housing at least differs markedly from that in the USA. That said, we just moved to a big city in Germany with a great public transportation system. For the 1st time in our married lives we are living and working w/o a car and it is amazing the money we are saving by doing so. We miss the convenience occasionally, but it’s also nice to not have the hassle with insurance, and repairs and maintenance. I think that one of things that has changed over the years is how cars and homes have, in some (many?) cases, become statements about the kind of people we are and the measure of success we have achieved (or not). I don’t think that was the case in 1913. Mr. Average today, I imagine, considers first what he WANTS and seldom asks the question: “Is this more than I really need?” or “Is this more than I can afford or should spend?” (The amt of consumer debt in the USA leads me to make this assumption). I remember being quite proud of my first car: a used Honda Civic that I bought in 1983 for $2800. Great car. There was a young lady at work that I was thinking I might ask out on a date and I asked her what she thought of my car. She didn’t say much, but her body language (the turning up of the nose mostly) communicated her thoughts pretty clearly. She obviously was not impressed; she drove a much nicer car (and probably paid a lot more for it). We never went out on that date. When I met my husband, he drove a hideous car. It was an awful shade of blue/green. The passenger side door didn’t open from the outside, so he would have to get in first and open my door from the inside! I don’t think my mother was too impressed! But I saw beyond the car he drove and realized he did it to save money, which I found admirable. He still drives a 13 year old car! His commute is 2 miles! He sees no need for a fancy car that he mainly just drives to work. He has talked about getting rid of it and just riding his bike or carpooling with a co-worker in the neighborhood. But it’s paid for and we keep it for convenience. I agree that people’s idea of what they “need” in a house is greatly over exaggerated. So many people living in 3000+ sq ft with families of just 2-3 people. Our house is 2000 sq ft. It is just fine for our family of 5. Especially considering that it was considered above average size when it was built in the 60’s. We upgraded from a tiny 3 bed/1 bath house, so having 4 bedrooms and 2 bathrooms feels luxurious! I do admit that I fall victim to the “if I only had more closet space” mentality from time to time. I guess that just goes to show that we probably have accumulated too much stuff. Great car story, Heather! Kudos to you for looking past the material to see other values in your man. My Honda Civic worked fine and looked fine, its only problem was, well, that it was a Honda Civic. In my comment I was trying to avoid making value judgments. I was simply trying to point out that in 1913 people were generally driven by need and in our first-world culture they are more often driven by wants. I’ve come to understand that the old bumper sticker slogan “He who dies with the most toys wins,” is a big lie. By the way, if your hubby would start bicycling to work, his health would also benefit greatly :) In our city, it’s incredible to me how many people ride their bikes everywhere–even in the rain, even in the winter. I’m working on that, but still prefer the tram/bus. I agree absolutely that people can live in whatever size house makes them happy. I’m glad we can all make those choices for ourselves. But from my experience with people I know, they generally are deep in debt to have the big house, the nice car, and all the latest gadgets and gizmos to go with it. If someone can comfortably afford that lifestyle, that is great. But many people have gotten caught up in the pursuit of bigger and more. One such family friend recently purchased a 3400 sq ft home after a job transfer. I thought it was interesting because I knew how much they struggled to afford home ownership in a house half that size and significantly cheaper. They are deep in debt otherwise as well. In their situation, a smaller and subsequently cheaper home would have helped them get out debt faster instead of burying them deeper. One particular point that stands out, was their inability to afford a much needed new A/C unit in their previous home. So what do they do? They buy a house that, due to its size, requires two A/C units! I have no idea what they think they will do when the day comes (and it will) when they have not one, but two air conditioners that need replacing. Just things like that I find amazing. I think your three points above describe them perfectly! My husband and I drive older used cars, live in a modest home and don’t spend money on the newest “toys”. Our TV was purchased in 1998 and still going strong! Our home is paid off and we don’t have a need for more. We have three young children and I stay home with them. I have no doubt people look at us and think we have to be careful with our money. “Why else would he drive that car??”!! Little do they know we pay cash for everything. This topic is very interesting to me. Does anyone watch House Hunters International on HGTV? The people who suffer the most culture shock seem to be Texans moving to Europe. But it’s not just the times change. America is just set up differently than other parts of the world with more available land to build on. 1000 sq feet would be considered very spacious in Europe, Japan or Hong Kong. I remember a house hunters where a woman from the Midwest moved to Norway (I think) with her Scandahoovian husband and kids. She turned down houses because they didn’t have garbage disposals! I think they ended up doing a custom build. Sadly, I relocated for work (well, yay for the work! ), but my house is still on the market :( I wish someone would buy my darling 600 sf condo! Living in 1,000 square feet is fine, it all has to do with being comfortable and not always wanting the biggest and best. I think a really important factor that many mention is bathrooms. 100 yrs ago only one parent would typically work outside the home, and kids often only went to school for a few years. The pace of life was generally slower, and nobody was expects to take a daily shower. Urine could easily be deposited in a chamber pot, so really, there was no bathroom line every morning. We talk a lot about how the automobile changed our lives, but hygiene habits and expectations I think play a large role as well. Great article…so true! I would even add that in addition to looking at ones square footage, one should also weigh the cost of renting vs. buying. Renting is not always a bad thing, especially if it is allowing you to invest and save. I agree. This post really helps put things in perspective. Our values really are manipulated and programmed by the commercial world. “Wants” are confused for “needs”. Judgments are made based on what we own and not who we are. It’s shallow and backwards. I’ve never cared about having a car to impress. Wife and I live in a practical 890 sq/ft. “cottage” and are so stinking content. I own quite a few rental houses that are much larger, but have no desire to live in any of them. Maybe if we would spend more time on what we are inside and spend less time, money and attention on the packaging, we’d be so much better off as a society and get back to liking one another again. 1) Live more like my grandparents. 2) Invest the difference and become a mini-capitalist, because that’s where the money is these days. I’m well on my way to number 1 (this weekend I’m moving my unmarried self back to a small apartment on the farm). Number 2 seems so simple, especially considering how much more income I earn than my granparents and how many more opportunities I have to deploy that capital. These have been two incredibly encouraging posts. For all people spend to add more and more garages to their homes, it boggles my mind that so few people actually put cars in them! Most of my neighbors have boxes of crap rotting in the garage, while their cars rust in the driveway. It makes no sense. Why are you protecting fifty dollars worth of thrift store crap, and keeping your five-figure vehicle out in the rain and snow? Bit of advice: pie charts are evil. Use ranked bar graphs instead. This is an interesting train of thought. Ultimately, each of us must establish what “enough” means in practical terms. As we all know at some level, living materialistically is a fraudulent choice. Life, death and the universe could care less what we own or how we wasted our time acquiring capital to spend. So, home ownership is just another existential expression of one’s close and immediate orientation to the purpose of human life. The housing situation has been driven by the real estate profs, mortgage bankers and the advertisers that play on the self-images of those who cannot craft their own self-worth. We, however, are simply victims of ourselves in allowing these external minions of profit to fleece us of our money. At some point, everyone realizes that the pursuit of materialism is a pursuit of human bankruptcy. My late husband and I bought our approx 900 sf 2BR, 1B bungalow as a ‘starter’, but when he got sick, I was glad that I could manage all the household bills and mortgage on my salary. It was tight for 2 adults and a teenager, but just fine for one person. With small living spaces, how it’s laid out and how much storage there is makes more of a difference than the absolute square footage, I think. My little A&C bungalow has a TON of built in storage and that makes all the difference (along with keeping the “STUFF” under control). Perhaps I am missing something, but I believe the $1300 a month income for the family in 1913 is wrong. In 1914, Henry Ford rocked the industrial world by paying $5 a DAY to his ee’s. (Before that, ave. wages were half that amount). $5 a day x5= $25 a week, x 52 weeks, would be $1300 A YEAR, not a month. And that was calculated at 1914 wages. In 1913, it would have been half that, $650. Further research found was that the ave. wage in 1913 was $740 a year, which is close to the 1/2 before Ford upped the wages. Also, if we are looking at total household income, we assume the spouse is working. Women were NOT earning the same wages as men. If you look up early pictures of employees at Ford, they are all men. Ave. teacher salaries (popular career for women in 1913) were around $400 a year. If the $1000 monthly income was for the year, and not a month, then all of the numbers are suspect, and the points are moot. Bruce, you said it a lot better than me, but that was my point, too. (See #41.) A reply to my post, however, is also worth a read. I cannot believe that there was absolutely NO food inflation in the past 100 years. Even for the past 12 years I have been tracking my expenses, they have gone up considerably. That is definitely wrong. 1000 ft^2 or thereabouts would feel a bit small but we could make it work. One bathroom however is a deal breaker for me. The house we rent now has only one bathroom and as soon as we have guests over, the situation is quickly miserable.